Palestinian villagers are suing two Canadian construction companies over their involvement in building a Jewish settlement in the occupied West Bank. The case, filed at a court in Montreal, accuses the firms of violating international and Canadian law. 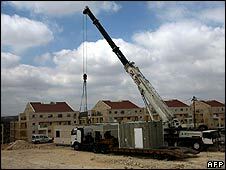 The Palestinians are seeking a court order to halt building work. The lawyer for the villagers says this is the first case in which a foreign private sector company has been sued for investing in West Bank settlements. The two companies, both registered in the province of Quebec, could not be reached for comment. The Palestinian villagers accuse the companies of violating international and Canadian law by building on land belonging to the village of Bilin, and selling the homes to Israelis. The building work is taking place on land seized from Bilin after Israel captured the West Bank in 1967, according to the legal papers. The villagers argue that the construction work violates international war crimes laws that forbid an occupying power from transferring its own people into occupied land. The villagers want the court to order the demolition of all the homes that the companies have built. They are also seeking punitive damages of nearly $2m (£1m). "My understanding is that it will serve as a blinking red light for any investors and corporations that are considering doing anything in the settlements," said Michael Sfard, the villagers' lawyer. Bilin has been the scene of ongoing protests over the controversial barrier built by Israel in the West Bank, which cuts Bilin from most of its agricultural land. In September, the Israeli Supreme Court ordered the government to redraw its route near Bilin, accepting an appeal by residents. The decision has yet to be enforced. In a continuation of their struggle for justice in the face of unlawful appropriation of their land, the people of Bil'in village yesterday commenced legal proceedings before the Superior Court of Quebec against Green Park International Inc. and Green Mount International Inc. The defendants are Canadian corporations registered in the Province of Quebec that have been involved in constructing, marketing and selling residential units in the illegal Jewish-Israeli settlement of Modi'in Illit in the occupied West Bank, on the land of the village of Bil'in. 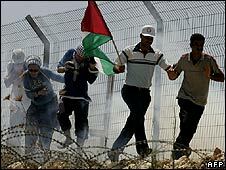 The land in question has been appropriated by the Israeli military authorities in violation of the laws of occupation. The defendants, on their own behalf and as de facto agents of the State of Israel, are constructing residential units on this Palestinian land for the purpose of housing Israeli settlers. The petition, filed by the Village Council's lawyer in Canada, Mark Arnold, demonstrates that in so doing, the defendants are aiding, abetting, assisting and conspiring with Israel, the Occupying Power in the West Bank, in carrying out an illegal act. Under the Fourth Geneva Convention, an Occupying Power is prohibited from transferring part of its own civilian population into the territory it occupies. Such transfer of settlers into occupied territory is a war crime under the Rome Statute of the International Criminal Court, as well as under Canada's Crimes Against Humanity and War Crimes Act of 2000. The petition thus argues that through their actions, the defendant companies have willfully or negligently participated in the violation of international humanitarian and criminal law, as well as domestic Canadian law. As such, Bil'in Village Council is entitled to obtain the cessation of the illegal activities of the defendants, and to reparation for injury caused, under both the Quebec Charter of Human Rights and Freedoms and the Civil Code of Quebec. punitive damages of CAD$2 million, to be paid by the defendants to the plaintiffs, as a result of injury willfully caused. The defendants have 10 days to file an appearance at the Montreal Court House. If they do so, the action will be presented before the Court on 11 August 2008. Should they fail to do so, a judgment by default may be rendered against them. Israel's construction of the Annexation Wall in the area has facilitated the appropriation of Bil'in's land, keeping the illegal Israeli settlement on the western side of the Wall and cutting off the Palestinian villagers from their land. Since 2005, the village's resistance to the appropriation of its land has been marked by weekly nonviolent demonstrations against the wall. In September 2007, the Israeli high court adjudged that the route of the wall in Bil'in was designed not for genuine security purposes, as claimed by the Israeli authorities, but rather to accommodate plans for the future expansion of the settlement of Modi'in Illit, and was causing unjustified harm to the residents of Bil'in. The court ordered the Israeli authorities to propose an alternative route for the wall in the area, such that unapproved settlement planning schemes were not taken into account. This decision, which has yet to be enforced, failed to give due regard to the 2004 Advisory Opinion of the International Court of Justice, which held that the wall inside the West Bank is illegal in its entirety and should be dismantled. The case in Canada regarding the Canadian corporations' involvement in the unlawful settlement construction was filed yesterday, 9 July 2008, to mark the fourth anniversary of the issuing of the Advisory Opinion.